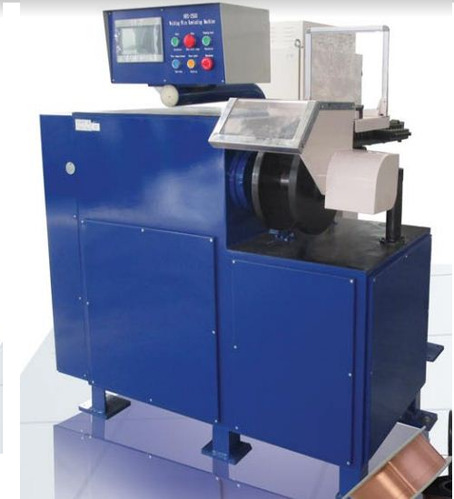 The layer winding machines are for Precision Layer Winding for welding wires like Copper Coated MIG wire, SS MIG wire and aluminum wires on plastic spools wire weight from 5 to 15 Kgs. (Optional attachment for metallic spool available). The line is supplied with a pay off unit, dancer unit for speed synchronization, layer winding spooler and electrical control panel with digital controls allowing an easier setting for every situation. Several machine options available suiting the varied requirements of spooling capacity and manpower skills dependency. Semi-automatic precision layer winding machine or random winding is possible with independent control selection. Linear winding speed ranging from 10 - 25 mtrs/sec. (Depending on the model). Spool to be used is good quality precision plastic spools as per DIN-300K with corrects & defined traverse width. Pay off suitable for DIN-630 Bobbins as standard. Options available for other Bobbin sizes like DIN-800 etc. Total Floor area required approx. 8mtrs. X 3mtrs. Motorized reversing in case of wrong winding for correction. Manual loading of empty spool and hooking of wire. Flange nut tightening or Pneumatic clamping depending on model. Manual guided winding of first layer with special material fork. Automatic precision layer winding until machine ramps down and stops after preset weight completion. Manual final wire hooking and unloading of full spool.